In the Sign-In panel, provide the user name and the password of your account and the server you want to sign in. Your user name and password will be authenticated, and you will authorized to perform functions according to your role. If you are sign in on for the first time after the installation, use the following credentials. 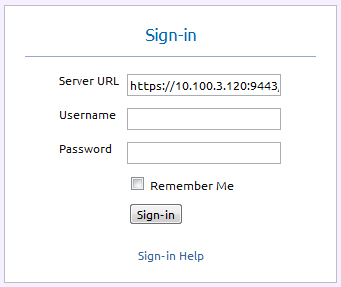 You can sign in to a remote server by specifying its URL in the 'Server URL' field. This field defaults to the value "https://localhost:9443/services/". Enabling 'Remember Me' option makes it possible to sign-in to the management console in subsequent attempts without entering user credentials. Please note that due to the inherited behaviour of default user store - which is embedded-ldap, user names are case insensitive in 3.2.0 based carbon products. Please make sure you change the password for the�admin account as the first task after you log on. You can change the password from the User management panel. Note that you cannot delete the�admin account. If you are not the administrator, please contact your administrator to create an account for you. User accounts and�user roles can be added and managed from the User Management page. Click Help on the User Management page for more information on adding and managing users. To access this page, in the navigator, under Configure, click Users and Roles.